Weekly Market Analysis: April 18th to 22nd 2016 - Find the best Binary Options Brokers, Binary Options Bonuses, Binary Options Signals, Binary Options Software and everything Binary Options related on Binary Options Directory! Weekly Analysis: Last week the bears made a strong statement by managing to break the bullish trend line seen on the chart below, after another bounce off of the key resistance at 1.1450, so the pair might be preparing for a deeper move south. This week we expect a continuation of the move started last week but the 50 days Exponential Moving Average represents a strong barrier and also a point where the bulls could step in to try and take back control. Near this zone we have 1.1210 support, a fact which adds more strength to the zone but the Stochastic and Relative Strength Index are moving down after being overbought and this favors a continued move down. As you can see, the balance is not heavily shifted towards one side or the other but we slightly favor a move south towards 1.1100. 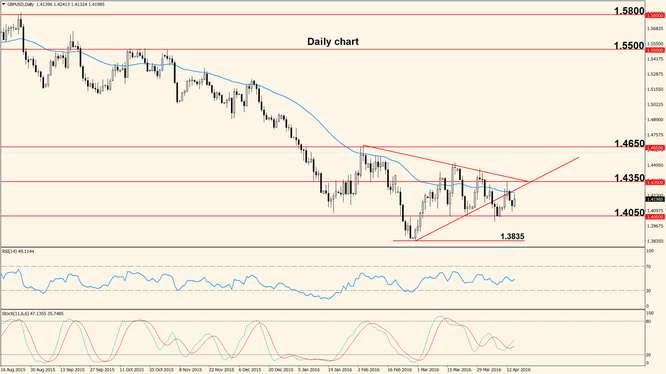 To the upside the levels to watch remain 1.1335 and the key resistance at 1.1450. The first important release of the week is the German ZEW Economic Sentiment, a survey of about 275 investors and analysts regarding the state of the German economy. The survey comes out Tuesday and the same day the U.S. Building Permits are released, offering a look into the health of the American construction sector. 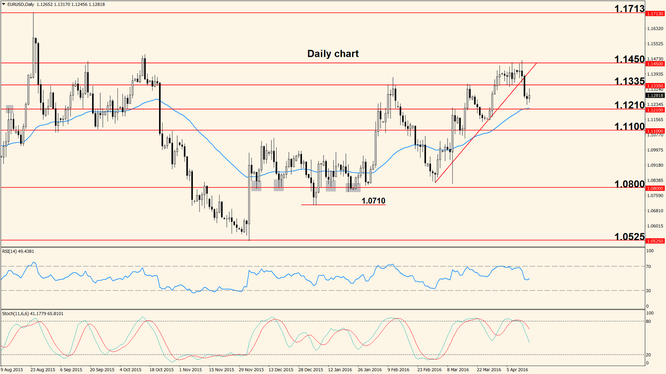 Wednesday is a slow day but action picks up Thursday when the European Central Bank announces the interest rate and ECB President Mario Draghi holds a press conference that is known to be a market mover and a reason for increased volatility. Friday the ECOFIN and Eurogroup meetings start, attended by key personalities from the Euro area and the same day the European Flash Manufacturing PMI and Flash Services PMIs are released; these are leading indicators of economic health focused on the respective sectors and usually have a hefty impact on the currency, with higher numbers strengthening it. The pair broke out of the triangle pattern it was in but the bears failed to capitalize and the ranging period is still not over. We expect a real breakout this week but so far the pair is hesitating to pick a side. Price lacks momentum and neither bulls nor bears are in control but the 50 days Exponential Moving Average as well as the previously broken trend line are in close vicinity and here we may get some clues about future movement. Price has already bounced lower once 1.4350 was touched but another bounce lower in the current area will show that price is indeed headed lower; of course, if this happens, 1.4050 will become the main level to break. Bank of England Governor Mark Carney will testify Tuesday before the Lords Economic Affairs Committee, in London. The event should be treated with caution because the Pound is likely to show irregular movement at the time. Wednesday the Claimant Count Change comes out, showing changes in the number of people who applied for unemployment related benefits during the previous month. A higher number shows that more people are unemployed and has a negative influence on the Pound, weakening it. The last important event of the week is the release of the British Retail Sales scheduled Thursday. Higher numbers for this indicator usually bring Pound strength but the impact is sometimes mild.